Part of planning for surgery should include your nutrition before and after surgery. Depending on what type of surgery you will be having might make a difference in the types of food you will be allowed to eat afterwards. Your doctor should be able to give you guidelines on what are good food choices to make. Please note: all articles are written on SimpleStepsForLivingLife are ONLY my opinions and should not replace that of a medical professional. This series of posts are about what I have learned from having surgery and being about to have surgery again. I am not a medical professional at all, please consult with your doctor or a medical professional when it comes to anything to do with your health. This post is part of a 31 day writing challenge, and the theme for SimpleStepsForLivingLife’s daily series is Prepping for Surgery. It is important to plan ahead if you are not in an emergency situation. Something that I’ve found in my research for preparing for my upcoming abdominal surgery is that I should avoid foods that may cause constipation. Some pain medication that is given for surgery can cause constipation. With the risk of giving out too much information, I will need to avoid foods that could cause straining for bowel movements because the needed muscles are going to be not working so great for the first couple weeks from the procedures. These foods will be avoided by me at all cost but depending on your surgery these foods may be something you need for a faster recovery. Always consult with your doctor about any questions regarding your surgery. Other foods that are not good for plastic surgery and probably some other surgeries are those that are high in sodium. Eating foods with salt will cause me to swell up like a balloon. This is a complete downer for me. 🙁 I love salt! It’s on the table for every meal. As a child, salt was even put on watermelon. So this will probably be more of a challenge for me to avoid than most people, but it is important for the type of surgery that I’ll be having. For some people it is essential to add salt to their diet especially before and after surgery. I have a great aunt whose body has trouble keeping sodium in her system which caused all sorts of problems for her recently. Luckily, when she was in the hospital after a surgery, her daughter made sure the staff were aware of her sodium deficiency and that salt needed to be included in her meal. This very well could have saved her life. With that being said, just because I have to avoid salt for my surgery and foods that cause constipation, but you may need the nutrients specific in these foods. Do your homework and consult your physician regarding all the nutritional requirements that are specific to your situation. Other nutrients that may or may not be right for your recovery include calcium, vitamin D, vitamin C, zinc, fiber, and iron and protein. Ask your doctor about these nutrient and whether adding foods rich in any or all of these are right for your situation. You will also want to consult the pharmacist when picking up your prescription as some foods don’t play well with medication. There are certain drugs that don’t work properly if grapefruit, grapefruit products, and a couple other different citrus fruits are consumed. Here’s a good description from WebMD of what can happen if you are taking a medication that does not work with grapefruit: Here’s what happens: Grapefruit contains furanocoumarins, which block an enzyme that normally breaks down certain medications in the body. When it is left unchecked, medication levels can grow toxic in the body. While discussing with the pharmacist regarding potential food and drug interactions, this would be a good time to ask if any other prescriptions you have would interact with medicine from the surgery. Nutrients are a key ingredient to a successful recovery. Research what nutrients are best for healing the part of your body that will be impacted by your unique situation. Be sure to discuss with your doctor what nutrients are most important for promoting healing from your specific surgery. Also remember to discuss potential drug interactions with your doctor and pharmacist. 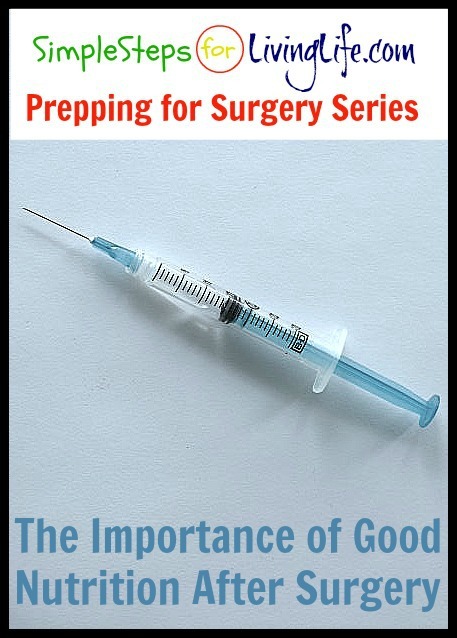 For more helpful Prepping for Surgery series articles, click here. For a FREE printable of questions to ask during your preOperation appointment, please leave your email address in the box below.